Roger Johnson's stone turtles take six hours to make and just a moment to give away. But, oh what a moment! 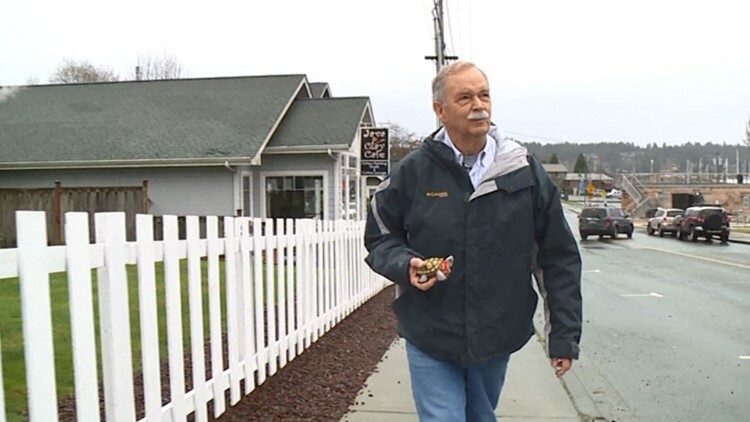 GIG HARBOR, Wash. — Though he's been retired since the turn of the century former Navy pilot Roger Johnson refuses to slow down and take it easy. So you might be surprised to learn his hobby involves turtles. With stones found on a beach, epoxy, paint, pens, and patience, Johnson builds turtles in the kitchen of his gig harbor home. “Each one has its own personality,” he says. But they are all colorful, amusing, and absolutely not for sale. So, instead, Johnson gives them away as rewards. He's given away hundreds of turtles to people all over Gig Harbor and Tacoma. Getting a signed Roger Johnson turtle is a little like winning a good citizenship award. A lot of the recipients have helped Johnson’s wife recover from cancer. “Everybody loves turtles,“ he says, “I haven’t found a single person that has said 'Oh I don’t like turtles'." Johnson drives around town with at least two turtles in the back. Sometimes the random act of kindness is his own. “You look like you could use something to brighten your day,” he says to a passing woman walking in the cold rain. She’s very pleased to get the gift. Like the turtles he builds, Roger Johnson can't help making everything a little nicer.